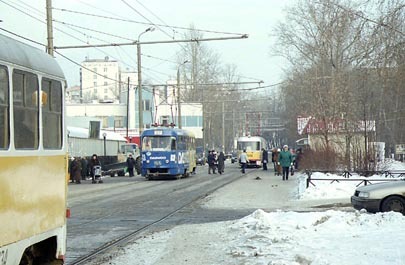 Sobolevskiy Proyezd, being a rather long street stretching between Mikhalkovskaya Street and Novopetrovskaya Street, makes up the Koptevo tram line. The regular service on this line was begun in 1933. As for the name of the street - it is old; this street was named in XIX century after the name of a local land-owner. But, of course, probably none of the XIX century buildings in the then rural area has survived, and today this district consists of typical block houses built in 1950-1970's. 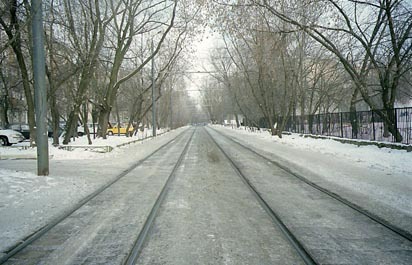 Five years later, in 1938, the tramline was extended to join the already existed line along Leningradskoye Shosse. 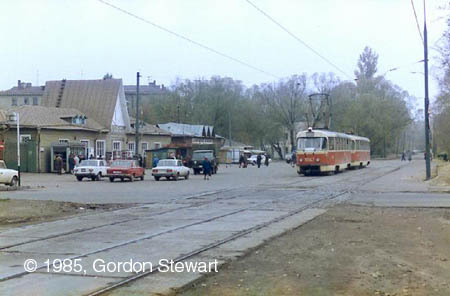 The former terminus Koptevo, though, for many years was used as a final destination of route 27, but in 1960's this loop was abandoned and later dismantled. Unfortunately, the progress moves on. 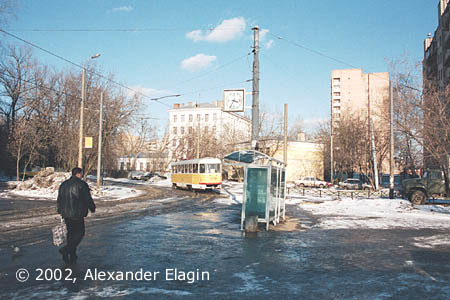 If a few decades ago (in 1964, for example) one could take a tram in Koptevo and get almost to the centre of Moscow - to Trubnaya Ploshchad and Chistye Prudy - without any transfer, today the tracks lead only to Dmitrovskaya station. Long ago there was a tram loop Koptevo not far from here - close to the five-storey buildings behind the trams. 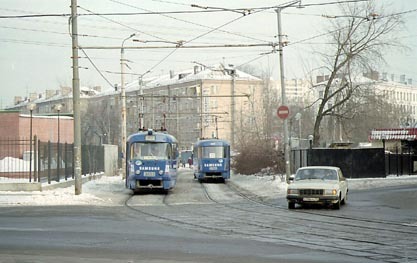 This is the very place where the tram loop Koptevo was. No tracks of the loop remain here, yet some traces still can be found - in placement of overhead support poles, and in this electric clock pole. Once upon the time all tram termini in Moscow had large electric clock, but unfortunately this practice is long gone. Sobolevskiy Proyezd does not have a heavy car traffic, it looks more like a silent garden lane. 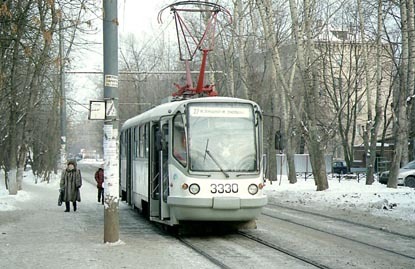 The modernized T-3 tramcar, now having the thyristor control and restyled appearance. All such modernizations are being done at the Moscow Tram repair shop. 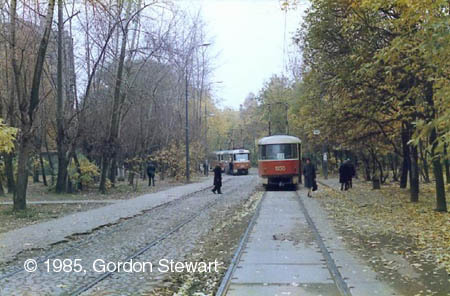 The dwelling houses are hardly seen through a deep 'forest' along the tracks, being just another demonstration of the enviroment-friendly nature of trams. Koptevskiy Market near the crossing of Sobolevskiy Proyezd with Koptevskiy Boulevard. Again the same place. The market has expanded in the last years and now occupies a large territory almost up to the tracks. Most shoppers get here by tram, of course. The last part of Sobolevskiy Proyezd, up to the crossing with Mikhalkovskaya Street, has a number of curves, but it is still mostly car free. 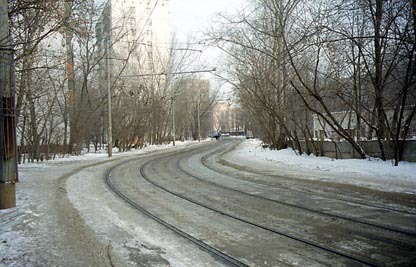 By the way, this almost-a-forest-line was severely damaged by the hurricane of 1998 (that year Moscow lost about third part of its trees, already weakened by salt wapours).